The royal wedding of Prince Harry and Meghan Markle is set to take place at St George’s Chapel at Windsor Castle this coming Saturday May 19, 2018. In case there was any doubt, Kensington Palace tweeted this past Sunday that Her Majesty the Queen has officially given her consent to the marriage. Here’s how the TV news networks are covering the big day. We will continue to update this post as additional coverage info trickles in. Special coverage of the royal wedding of Prince Harry to Meghan Markle will feature an extended edition of Good Morning America on Saturday (5:00 – 10:00 a.m., ET) on ABC. GMA Co-anchor Robin Roberts and World News Tonight anchor David Muir will lead live coverage from Windsor, England. Robin Roberts and Muir will be joined by a team of reporters and royal experts, including GMA Weekend Anchor and The View co-host Paula Faris, correspondents Deborah Roberts, James Longman, Adrienne Bankert, contributors Cindi Leive, Imogen Lloyd Webber, Victoria Murphy, Omid Scobie and British Royal Biographer Andrew Morton, who will bring live reports of the arrivals, ceremony, carriage ride around Windsor and other festivities from various locations throughout Windsor and London. Freeform and ABC News digital platforms including, ABCNews.com and GoodMorningAmerica.com, mobile apps, social platforms and OTT services, will also simulcast the 5-hour special edition. An additional hour of GMA will air Saturday at 7:00 a.m. PT for the West Coast. 20/20 prime time specials on Friday (10:00 – 11:00 p.m. ET) and Saturday (10:00 – 11:00 p.m. ET) with Muir anchoring and Deborah Roberts reporting from Windsor. 20/20 takes a look at the two most important women in Prince Harry’s life: his mother, Princess Diana, and his soon-to-be bride, Meghan Markle. The special highlights the similarities between both women and how Diana transformed the perception of the royal family and how Meghan, with her classic style, humanitarian work and career, is poised to redefine the role of royal spouse. The hour will look back on Prince Harry’s and Meghan’s relationship and ahead to the last minute details leading up to the wedding of the year and what the future holds. Saturday’s special, airing just hours after the wedding, will recap the day’s most memorable moments, including the vows, reception, fashion, the royal couple’s first public appearance following the wedding and other inside details. The new augmented reality (AR) feature from ABC News will deliver a new way to celebrate the royal wedding. Available on the ABC News iOS App, it gives fans the opportunity to take photos with a 3D royal carriage or pose next to a 3D Queen’s Guard and share with family and friends on social media. 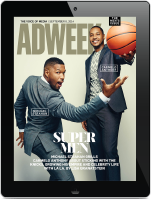 The AR feature is available beginning this week. CBS This Morning co-host Gayle King and Entertainment Tonight’s Kevin Frazier will anchor CBS News’s multi platform coverage of the royal wedding beginning at 4 a.m. ET on Saturday, May 19 on CBS. CBS News royal contributor Tina Brown will join King and Frazier for the coverage, to provide insight into the Royal Family and the events of the day. CBS News will also present Royal Romance: The Marriage of Prince Harry and Meghan Markle, a two-hour prime time special on Saturday May 19 at 8 p.m. ET. CBSN, CBS News’ 24/7 streaming news network, will stream coverage of the ceremony and festivities beginning at 4 a.m. ET on Saturday with interviews and analysis following the special event. Coverage will feature the run-up to the wedding, original reporting exploring the couple’s path to the altar, the wedding service live from St. George’s Chapel at Windsor Castle, and the post-ceremony parade. For CBS Newspath, correspondent Teri Okita will offer packages designed to illustrate the significance of the events happening across the pond. CBS News Radio will provide live anchored coverage of the event with Correspondent Steve Futterman on the ground in London. CBS News Radio will also simulcast CBS TV coverage. CBS News Radio provide short form special reports during the ceremonies. The CBS News Weekend Roundup will broadcast a one hour Royal Wedding special that evening. 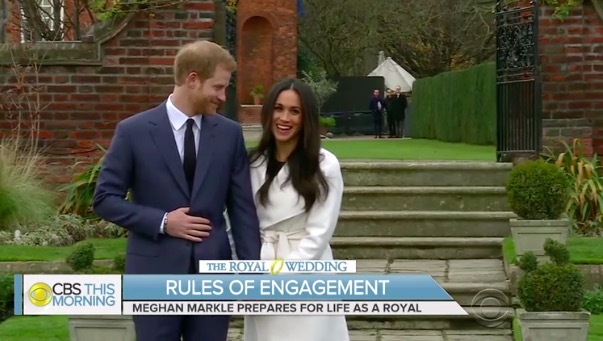 Entertainment Tonight will broadcast from London and Windsor the entire week of May 14 leading up to the wedding with special royal coverage on the nightly broadcast and on ETonline. A full recap of the Royal Wedding from Windsor Castle will air on ET Monday, May 21, with the latest on all the fashion, the celebrity guest list and the biggest moments from the ceremony. Savannah Guthrie, Hoda Kotb, Megyn Kelly, Kathie Lee Gifford, Al Roker and Sheinelle Jones are all heading to England to cover the wedding, starting with a prime time special on Wednesday, hosted by Guthrie and Kotb. 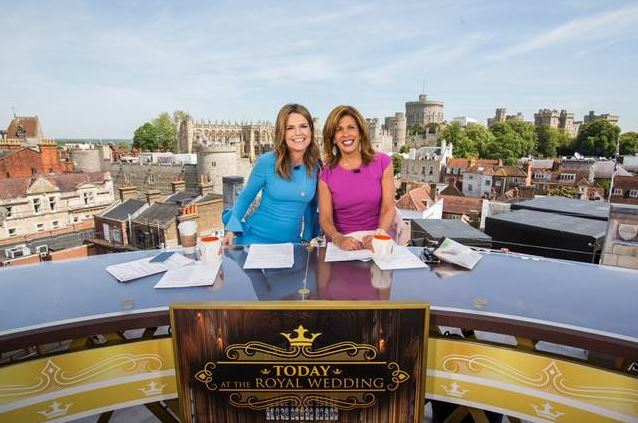 Ahead of the nuptials, Guthrie, Kotb, Kelly and Gifford will broadcast their respective hours live from an exclusive location overlooking Windsor Castle on Friday, May 18 (7-11 a.m. ET). On Saturday, May 19 (4:30-11 a.m. ET), Guthrie and Kotb will co-anchor Today at the Royal Wedding from an exclusive vantage point overlooking Windsor Castle where Prince Harry and Markle will emerge as husband and wife. They will be joined by Kelly, Gifford, Roker and Jones from various prime locations. Additionally, there will be a team of NBC News correspondents, including Rehema Ellis, Stephanie Gosk, Keir Simmons, capturing every facet of the royal wedding and its festivities in and around Windsor and London. The broadcast will also include insight and analysis from royal experts and contributors: Wilfred Frost, co-anchor of CNBC’s Closing Bell; Zanna Roberts Rassi, British fashion expert and senior fashion editor of Marie Claire; Andrew Roberts, British historian; Camilla Tominey, royal editor of Sunday Express; and Ken Wharfe, Princess Diana’s former bodyguard. Diamond Producers of America is sponsoring the Today.com livesteam and Today on-air coverage leading up to and including the day of the wedding and Tiffany is sponsoring all lead up and day of coverage on CNBC and MSNBC. Over on MSNBC – Beginning Saturday at 4 a.m. ET, Joy Reid, host of AM Joy, anchors special coverage of the royal wedding of Prince Harry and Meghan Markle live from MSNBC headquarters in New York City. MSNBC anchors and NBC News correspondents Stephanie Ruhle and Katy Tur anchor MSNBC’s on-the-ground coverage live from Windsor. Frost, the Closing Bell co-anchor, will also be covering as the point person for CNBC. Wilfred Frost is the son of the late British broadcaster David Frost, and he’ll be returning to his home country to cover the big day. Continuous live programming the morning of Saturday, May 19 starting at 5 a.m ET/2 a.m. PT, followed with Megan y Harry, La Boda Real, a Al Rojo Vivo special airing at 10 p.m. ET / 9 p.m. CT. Emmy-award winning anchor and journalist María Celeste Arrarás will lead the coverage, produced in collaboration with NBC and featuring conversations with experts, friends of the Royal Family, and correspondents in Windsor, London and Rosarito, the Mexican town where the father of the future princess lives. “I’ve had the opportunity to cover several royal weddings, but none like this. Megan and Harry’s wedding actually has the Cinderella factor: It’s like a fairy tale,” María Celeste commented. “We’ll watch as a young actress from Los Angeles sees her dreams come true and becomes the first British princess born in the United States. María Celeste and Al Rojo Vivo correspondents Rodner Figueroa, Nicole Suárez and Enrique “Quique” Usales will report from Windsor Palace, the site of the Royal Wedding, as well as from London and other places in the UK to document the couple’s journey and the reaction of the British public. They’ll consult with expert royal-watchers, friends of the Royal Family and fashion commentators to produce the most complete coverage of this eagerly awaited event on US Spanish-language television. Univision News’s Maria Antonieta Collins, along entertainment reporters Tanya Charry, Tony Dandrades and Maity Interiano, are bringing complete on-the-ground coverage from Windsor all week, covering everything from royal wedding traditions, royal guests and fashion, to how the new generation of royals are breaking protocols. Protocol expert Pilar Muiños Morales will join Univision hosts to talk about etiquette and royal tradition that guests at St. George’s Chapel will be expected to follow during the ceremony. Despierta América’s Maity Interiano reports directly from Windsor Castle with a closer look at Prince Harry’s bride-to-be, Meghan Markle, her family, career, and the new life that awaits her as a modern-day princess. El Gordo y La Flaca’s Tanya Charry explores the fascinating facts of royal protocol, horse-drawn carriage processions, the guest list, the wedding photographer, menu, and the royal cake. Primer Impacto’s Tony Dandrades will talk to the Latino Community in London, and report on the security operation behind the May 19 event, which is one of the most expensive aspects of the wedding. Univision News’s Edición Digital will provide news and information along the couple’s path to the altar with a full recap after the royal wedding featuring the latest on celebrity guest fashion and the ceremony’s most memorable highlights. BBC News will stream the Royal Wedding between HRH Prince Harry and Meghan Markle live and for free, on BBC.com. The stream is available globally, including the US and Canada, and will begin at 5 a.m.ET on Saturday . There is also wide-ranging news and feature coverage of the wedding online on BBC.com’s special Royal Wedding hub. Television coverage of the Royal Wedding on BBC World News is co-anchored by Katty Kay, Babita Sharma and Lucy Hockings. There will be three days of live coverage, with the hosts reporting from all the events in Windsor, including the crowds gathering outside the castle and elsewhere in the city, interviewing those invited to the wedding and those watching on public viewing screens around town, and catching the mood of the British public and international visitors who have come to witness the Royal Wedding. BBC World News coverage includes special films and colour features from across the UK and from the US, including Meghan Markle’s home town of Los Angeles, as well as from other locations around the world linked to the couple. On the day (Saturday), BBC World News will show the BBC’s main Royal Wedding program of the marriage itself for approximately four hours with live coverage before and after. Coverage of the ceremony on Saturday starts at 5 a.m. ET and concludes with a BBC News Special from 9 a.m. -1 p.m. ET. Anderson Cooper, Alisyn Camerota and Don Lemon to anchor special coverage of the much-anticipated Royal Wedding of Prince Harry and Meghan Markle live from Windsor beginning at 4 a.m. ET on May 19, and will be joined by CNN’s Royal correspondent Max Foster, CNNI anchor Richard Quest, senior international correspondent Clarissa Ward and fashion expert Joe Zee. Rounding out the team will be CNN Royal commentators Victoria Arbiter and Kate Williams, CNN contributor and author Sally Bedell Smith, Prince Harry biographer Angela Levin and Boston University dean and Megan Markle’s former theater professor at Northwestern University, Dr. Harvey Young. Reporting throughout the day from various locations and events around Windsor, will be CNN reporters Kate Bennett, Jason Carroll, Bianca Nobilo, Isa Soares and Nick Watt.Wedding day coverage will follow the procession as it makes its way to the castle along the riverbank with multiple views of St. George’s Chapel, and will be simulcast across CNN/U.S., CNN International and HLN Headline News. CNN will replay the nuptials at 8pm ET on Saturday and HLN will re-air at 3pm ET. CNN will live stream the Royal Wedding on Saturday, May 19th from 5-9 a.m. ET on CNN.com’s homepage and across mobile devices via CNN’s apps for iOS and Android. The Royal Wedding can also be viewed on CNNgo, which is available at CNN.com/go on your desktop, smartphone, and iPad, plus the CNNgo app for AppleTV, Amazon Fire TV and Roku TV devices. FNC will present live, extensive coverage surrounding the royal wedding of Prince Harry and Meghan Markle on Saturday, May 19th. Main coverage of the historic nuptials will be co-anchored by FNC’s chief news anchor Shepard Smith and co-anchor of America’s Newsroom Sandra Smith from outside St George’s Chapel at Windsor Castle beginning at 6 a.m. ET. Fox & Friends Ainsley Earhardt will co-host Fox & Friends Weekend live from Windsor, England beginning at 5 a.m. ET and then joining coverage of the main event at 6 a.m. ET. Contributing to coverage will be London-based senior foreign affairs correspondent Greg Palkot, London-based foreign affairs correspondent Benjamin Hall, Washington-based news correspondent Gillian Turner and Milan-based correspondent Amy Kellogg. They will be providing updates starting on Thursday at Windsor locations including, Castle Hill, the church lodge, rugby grounds and the Buckingham Place/Canada Gate. Special contributions will also be made by royal correspondent Louisa James, Harry Herbert, son of The Earl Carnarvon and close friend of Princess Diana; Lieutenant of the Royal Victorian Order and former Senior Communications officer for the Buckingham Palace, David Pogson. On Thursday, and Friday, Earhardt will co-host Fox & Friends live from Windsor while Steve Doocy and Brian Kilmeade will provide coverage from New York. Smith will co-anchor America’s Newsroom live from Windsor while Bill Hemmer will provide coverage from New York. Shepard Smith will also anchor Shepard Smith Reporting on Thursday and Friday from Windsor. FoxNews.com will launch three special royal wedding pages where users can find all content related to the event, British Royals along with behind-the-scenes interviews, social media posts and photo galleries featuring all of the best snapshots from the celebration. Foxnews.com will also provide live updates throughout the ceremony as well as a live stream of the wedding. Fox News Radio will air a five-part series beginning on Monday, May 14, anchored by London reporter Simon Owen. FNR will also provide complete wedding coverage hosted by Owen along with FNR reporter Tonya J. Powers which can be heard on www.FoxNewsRadio.com and Fox News Headlines 24/7 on SiriusXM Channel 115.